Suggested Use: 1-3 capsules daily or as directed by a health care professional. Keep frozen until opened, then refrigerate. Illuminol — a breakthrough in controlling age-related disorders! 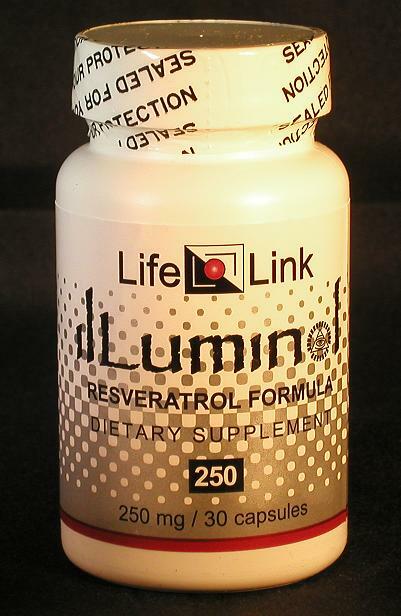 ‘ilLuminol’ is LifeLink’s tradename for resveratrol. This product contains resveratrol and two bioavailability enhancers: quercetin and piperine. Resveratrol itself is a substance found on grape skins and in certain other plants. It is an antioxidant and it also has direct effects on the activities of certain genes and proteins. The optimum dosage of resveratrol depends upon the ailment one is trying to prevent or treat. Experimental data suggest that doses from 24 to 3600 mg/day may be beneficial. LifeLink has adopted 250 mg/day as a representative value for this range — an amount which is both affordable and plausible as a preventative for everything from cardiovascular disease to cancer, and from obesity to aging. Resveratrol was of little interest to researchers until the 1990s when it was discovered that it interferes with the clumping of blood platelets. Since platelets are involved in the formation of the plaques that clog arteries and cause atherosclerosis, it was suspected that resveratrol might turn out to be useful for preventing or treating cardiovascular disease. As more and more researchers turned their attention to this promising agent, many other potential applications were revealed. By the beginning of 2009 more than 2500 research studies had been published that dealt in some way with resveratrol. Let’s look at two of these applications — aging and cancer — in a little more detail. Does resveratrol slow, stop, or reverse aging? Does resveratrol prevent, slow, halt, or reverse cancer? It would be nice to be able to point to definitive clinical studies as proof of its anti-cancer effect in humans, but the world of medicine does not understand the concept of ‘timely action’. Thus, no official human studies have been done12 — despite the fact that cancer is one of life’s biggest killers, and billions of dollars are spent each year on studying and treating this disease. All of the relevant studies use lab animals and cell culture experiments. For example, a 2008 study showed that resveratrol prevented liver cancer in rats.17 A 2002 study showed that it prevented and treated esophageal cancer in rats.61 In another rat study, it prevented colon cancer.62 Breast cancer suppression was shown in a cell culture study using human breast cancer cells.20 These and many other studies would convince any rational person that this is an anti-cancer supplement worth using — notwithstanding the medical bureaucrats who claim that people should wait for years and years until huge clinical trials have been conducted to prove that it works in humans. The “bioavailability” of a substance is the fraction of a consumed substance that reaches the circulatory system unchanged from the chemical form in which it was consumed. The term is sometimes used loosely to include altered forms that have the desired activity in the body. It is generally agreed that the bioavailability of orally consumed resveratrol itself is low — very little of it is absorbed unaltered.64,65,66 But recent studies have shown that most of the consumed resveratrol is converted into absorbable derivatives which do end up in the blood.67 The still-unanswered question is: how much of these absorbable derivatives are converted back to resveratrol when they enter the cells? If the percentage of back-conversion is low, then most of the consumed resveratrol is probably being wasted, since the derivatives are not thought to be very biologically active, and are excreted quickly. In that case, it would be beneficial to increase the absorption of resveratrol itself and block the formation of the derivatives. This is the approach that we have taken at LifeLink — our resveratrol formulation, ilLuminol™, includes quercetin and piperine, which block the formation of derivatives and enhance the absorption of the unaltered resveratrol. Plants that contain resveratrol always contain other interesting polyphenols, some of which contribute to the benefits of resveratrol supplements.68 For example, the roots of Polygonum cuspidatum, the source of LifeLink’s resveratrol, also contain polydatin69 (a cholesterol regulator) and piceatannol (a substance with anti-cancer and anti-Alzheimer’s properties70). Many of the polyphenols in these plants have yet to be studied in detail, and some of them are thought to have important benefits. This is why LifeLink chose to include them in its formulation of Illuminol. Resveratrol does not ‘keep’ well compared to most supplements. It can be damaged by prolonged exposure to light, or by warm temperatures in the presence of oxygen. Consequently, many of the resveratrol products on the market have lost most of their potency by the time they reach the customer. To maintain the potency of resveratrol supplements these products should be protected either from light and heat, or else from oxygen, from the time they are extracted from botanical sources until they reach the customer; and then the customer should store them in a freezer — except for the jar that is currently in use, which should be stored in a refrigerator. LifeLink’s resveratrol supplement is protected from bright light and is kept at temperatures below 0°C (32°F) from the time of manufacture until it is shipped to the end-user. The optimum dosage of resveratrol probably depends upon the ailment one is trying to prevent or treat. Epidemiological evidence suggests that the optimum dosage for preventing cardiovascular problems is just a few milligrams per day — because it is thought that resveratrol in red wine is responsible for the low incidence of cardiovascular disease in France, where fatty foods and red wine are both consumed in substantial amounts. A bottle of red wine contains typically less than a milligram of resveratrol. Anti-aging and anti-cancer effects may require much larger doses. No one knows how large. Single doses of up to 5000 mg of resveratrol have been tested on volunteers and no significant negative side effects were seen. But few people could afford the cost of such a regimen on a daily basis. Anti-cancer benefits in lab animals have been seen at doses ranging from 2 to 300 mg/kg body weight.61,17 This translates to about 24 to 3600 mg for a human (using the surface area method of scaling dosages). LifeLink has adopted 250 mg as a representative value71 for this range — an amount which is both affordable and plausible as an effective anti-cancer supplement. Some supplements and drugs have benefits that are immediate and obvious — like aspirin, for example, which can provide pain relief in less than an hour. Others, like resveratrol, have benefits that show up only with the passage of months, or even years. It’s difficult to maintain a regimen when the benefits can’t be seen right away. It’s difficult to continue spending money on them, while wondering whether they are even working. This problem is made worse when one realizes that there are, in fact, many substances on the market that don’t work. The cosmetics industry, for example, sells many phony, useless products, advertising them as “anti-aging” cremes and the like. Anyone who starts using resveratrol will soon realize that the beneficial effects it has on the body take place too slowly to be noticed on a day-to-day, or even a month-to-month, basis. How, then, does one avoid ‘falling off the wagon’ — becoming lax or forgetful about taking it daily, or deciding to save money by not reordering? At LifeLink we are not inclined to use supplements “on faith” that they work, and we don’t expect our customers to do so, either. That’s why this website contains so many technical references to support the products we have decided to sell. The scientific research that is being directed at resveratrol gives us good reason to think that this substance is a true breakthrough in the battle against aging and age-related diseases. Don’t just take our word for it: follow some of the links in the list of references below so that you’ll be able to use this supplement on the basis of evidence, not faith. And for additional support you can join the online resveratrol support group. Is ilLuminol the ultimate anti-aging supplement? In a word: no. This is just one step along the path to effective rejuvenation technology. A number of more powerful derivatives of the resveratrol molecule are already being investigated as potential anti-aging substances,9,72 and eventually some of them will probably make it through the regulatory maze and reach the market — most likely as expensive prescription drugs at first, until the developers have recovered the outrageously high development costs and then wrung as much money out of the public as possible. Eventually they should be available as supplements — and by then, even more effective rejuvenation technology should be under development. It should also be mentioned that resveratrol and its derivatives affect just one of several causes of aging. Other substances and methods will be required to deal with the other causes. We highly recommend the review article in Wikipedia.1 Other good reviews are the ones by Guarente3; the inflammatory diseases article by Shakibaei, et al11; and the cancer articles by Athar73 and by Aziz23. The geometric mean value of this range, (24*3600)^(1/2) = 294, serves as the basis for LifeLink’s resveratrol dosage of 250 mg/capsule.